What Is a GoPro Action Camera? Learn about the HERO7. 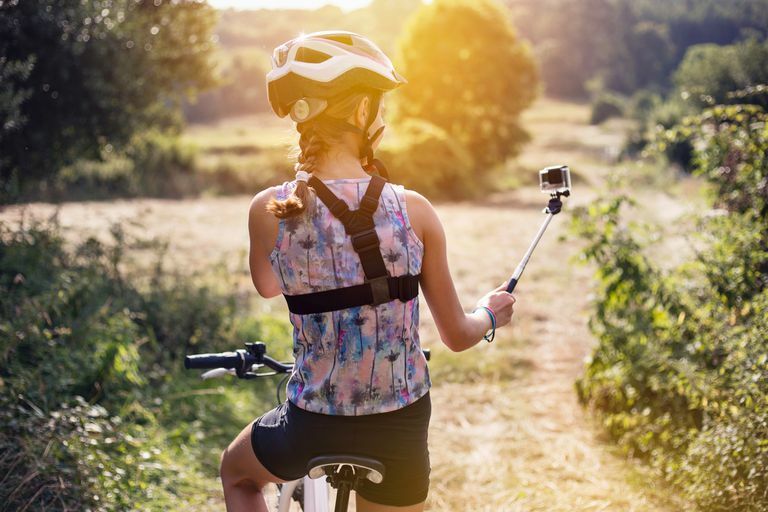 A GoPro is a wearable camera suited for rough-and-tumble environments (mountain biking, skateboarding, even sky-diving). GoPro is by far the most well known brand of wearable action cameras. The company has competitors, but none can match GoPro’s name recognition. GoPro cameras are ubiquitous among extreme athletes and adventurous users. What sets these apart from other cameras is that they capture the photographer (or drone’s) point of view of the so those watching the video can feel like they’re skiing, surfing, sky-diving, or flying. Its flagship cameras are the Hero series. GoPro cameras are made to be worn while surfing, skiing, snowboarding, biking, mountain climbing, and other activities, though it doesn't have to be an extreme sport. Some people even mount them on their pets. From the start, GoPros were meant to ride along with you in the water, snow, and other harsh environments. Earlier models required a waterproof housing to protect them from the elements, but newer ones can withstand depths from 16 feet to 131 feet. You can link newer GoPro models to your Android or iPhone to offload images and video, and edit them into short clips using the GoPro’s mobile apps. With the GoPro app, you can control your camera and share your clips to social media. GoPro also has an app called Quik where you can add special effects and music to your footage to create a QuikStory. You can upload up to 75 photos and video clips from your smartphone’s built-in photo app, Google Photos, Dropbox, and GoPro Plus cloud storage. The app can detect faces and colors and will select the best moments from your clips. Then you can customize your clips with more than 20 themes, as well as a variety of fonts, filters, graphics, and even emojis. The app includes over 100 free songs, or you can mine your collection. You can then share the final product to your favorite social media channels. GoPro PLUS is a paid subscription service that includes several perks including a no-questions-asked return policy if you break your GoPro. It also offers cloud storage so you can automatically upload footage from your camera so you can access it on your smartphone or computer. You can store unlimited photos in your GoPro cloud account and up to 35 hours of video. Subscribers also get 20 percent off mounts and accessories, and access to a soundtrack library. GoPro was founded in 2002 by Nick Woodman, a surfer, who wanted to capture quality action photos of he and his surfing friends, but discovered that the equipment needed was prohibitively expensive for amateur photographers. Thus, his group of friends had a goal of “going pro,” which would give them access to professional photographers and videographers who could take killer shots. As we now know, Woodman created the GoPro camera, and the company, rather than becoming a professionial surfer.